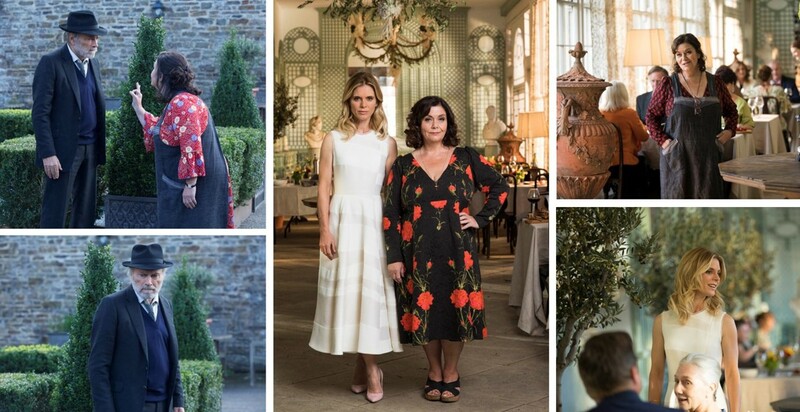 Sky has release the first images from the second season of its comedy/drama Delicious starring Dawn French and Emilia Fox. Delicious is set in Cornwall and follows a group of characters in a story of love, heartbreak, food and friendship. Dawn French plays passionate cook Gina, who has inherited the Penrose hotel and restaurant together with the glamorous Sam (Emilia Fox), both former wives of the deceased head chef Leo Vincent (Iain Glen). Since the end of the first season, Gina and Sam’s business has been booming, their delicate friendship has lasted and they are on the lookout for a new protégé in the kitchen. But it’s not long before the dynamics of family, love, rivalry and life start to get in the way of their success. Not least when Gina’s estranged father (Franco Nero) turns up at the doorstep combined with further surprises from the past and the impact of Leo’s legacy. Delicious also stars Sheila Hancock as Leo’s mother Mimi, Tanya Reynolds as Gina’s daughter Teresa, Ruairi O’Connor as Sam’s son Michael. Aaron Anthony also joins the cast as Adam, the new protégé at the Penrose hotel. The new season is set to debut on Sky One in late December.